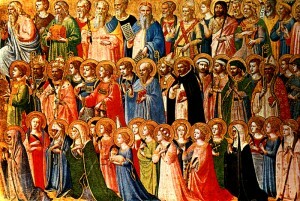 On All Saints Day, November 1 of each year, we celebrate all those holy people who are now enjoying eternity in Heaven. The first of the saints are all the martyrs and apostles who died for the new Christian faith. They are said to be welcomed into heaven because they were willing to sacrifice their life to spread the Word of God. As there were fewer martyrs, and the faith was being accepted as a legitimate religion, there had to be another way for those faithful to be welcomed into heaven, besides sacrificial death. Therefore, those holy people who sacrificed their lives for Our Lord also are welcomed into heaven. Saints did not live perfect lives. If you read stories of the saints, many of them had little to no faith before something dramatic happened and they changed their lives. Many died young. But in all of their stories, they did all they could in the short time they lived on this earth to share the love and life of Jesus Christ with others. And, because we know they are in heaven, they are able to intercede for us to Jesus, and ask Him on our behalf to answer and grant our prayers. We are not to worship the saints. We are allowed to pray to them, or use their prayers to ask for our special intentions. We can also thank them for their help by donating or offering up prayers of thanks in their name. We are all called to be living saints here on earth, with the hope that after our death we too will be raised up to join the Holy Trinity in Heaven. We are called to turn away from sin, celebrate the Mass, participate in the sacraments and live holy lives. One step at a time…celebrate Mass. We can not do it all at once, but starting on this little upgrades, one at a time, we too can become saints. Find a patron saint whom you can pray for their intercession. There are so many wonderful saints with so many wonderful stories. You can even pray to a loved one who died in faith. Pray for their soul in purgatory, and for a miracle to show you they are in heaven. Named saints are not the only ones in heaven – there are so many more we don’t know, whom you may only know. Pray the Prayer of St. Gertrude to release 1000 holy souls from purgatory to be welcomed into heaven! Then you can ask those new saints to pray for you in turn.